Fifth disease, or slapped cheek disease, is a common virus infection affecting young children. Officially called erythema infectiosum (EI), it is often referred to as the fifth disease (of childhood infections) - with measles, mumps, rubella and chickenpox being the first 4 diseases. Fifth disease infection is due to a virus known as parvovirus B19. This can spread through breathing in tiny droplets present in the air through infected people’s coughs and sneezes. It can also spread through blood transfusions and from mother to unborn baby. In children, about 7 days after contact with the virus, there is usually a mild flu-like illness that may last a week. A few days later the signs of infection are seen. This usually takes the form of a bright red rash on the face, often referred to as the ‘slapped cheek’ rash. A day or 2 later, a fainter, sometimes lacelike rash may also be seen on the arms and legs. The rash may be itchy and is usually over in less than a week, but may reappear. Sore throat and swollen glands may also occur. Adults can also have fifth disease. In most cases they will experience pain in the joints, especially the hands, knees, wrists and ankles. Adults are less likely to get the slapped-cheek appearance. If your child (or you) has been unwell with what you think is the flu and later develops bright red cheeks, fifth disease may be the cause. Some adults and children do not have any symptoms. In people with disorders of the blood or problems with their immune system, fifth disease can trigger anaemia. Sometimes a blood transfusion is needed to deal with this problem. Many women have already been exposed to parvovirus B19 and are immune to it, and there is no risk to these women and their unborn baby from being exposed to someone with parvovirus B19 infection. For women who are not immune, if they catch parvovirus B19 in pregnancy they will usually have only a mild illness. However, rarely, parvovirus B19 infection will cause the unborn baby to become anaemic and this may result in miscarriage. Treatment is aimed at relieving symptoms. Rest and pain relief may keep you or your child more comfortable until the illness is over. There is no vaccination or medicine to prevent fifth disease. People with fifth disease are most infectious before they get the rash or joint swelling, at the stage when they might feel like they are getting a cold. This means there is little point from excluding people with fifth disease from work, school or childcare because once they realise they have fifth disease, it is too late to prevent its spread. If you are pregnant and there is an outbreak of fifth disease at your work, discuss the risk with your doctor. 1. Centers for Disease Control and Prevention (CDC) [website]. 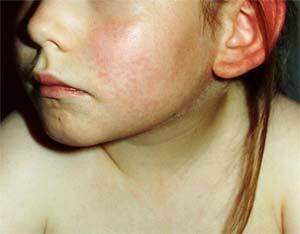 Parvovirus B19 (Fifth disease) [updated Feb 2012). http://www.cdc.gov/parvovirusB19/fifth-disease.html (Accessed Sept 2015). 2. NHS Choices. Slapped cheek disease. Jan 2014. http://www.nhs.uk/conditions/slapped-cheek-syndrome/pages/introduction.aspx (accessed Sept 2015). 3. NSW Health. Parvovirus B19 (Fifth disease). Jan 2008. http://www.health.nsw.gov.au/Infectious/factsheets/Pages/Parvovirus-B19-and-(Fifth-Disease).aspx (accessed Sept 2015).